The area was full of clothing, shoes, a crushed box of flowers and magazines - all now sad relics of the lives of the deceased and injured. As the sun rose on the morning of Sunday, 30 September 1945, just after all the traumas of the Second World War, the 4.23 am Perth to Euston Express train the ‘Royal Artilleryman’ reached Bourne End and derailed right in front of the signal box. 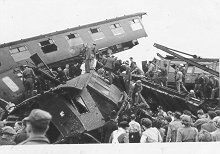 Dacorum, in spite of being on one of the most heavily used stretches of line in the country, had seen relatively few rail disasters, but this one was agreed at the time to be the worst for over 30 years. 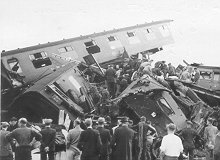 The train was packed with 700 passengers, many of them servicemen and women. It shot past the points whilst moving at speeds of between 60-70mph from the fast to the slow line. 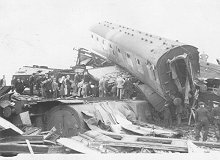 No-one could ask Driver Sidney Swaby or Fireman Walter Jones why they were going so fast, since they both perished. The rescue operations were very well organised, with help from National Fire Services, the Red Cross, St John’s nurses, ex- Civil Defence workers and the Women’s Voluntary Service, as well as local people. 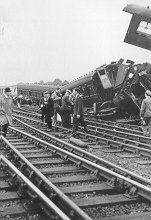 In his book ‘Bourne End Rail Disaster 1945’, Ray Potter describes how one rescue vehicle ploughed through a field of mangel-wurzels which shot into the air like grenades. There were many tragedies, including the deaths of several young brides. The casualties were taken to the West Herts. Hospital in Hemel Hempstead, where staff dealt with the minor injuries, shock, fractures and amputations. Those who had died were taken to the mortuary at Berkhamsted to await identification. Many could only be identified from personal possessions, such as rings or toys. 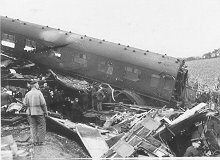 The Ministry of War Transport Inquiry into the disaster was opened at Watford on 4 October 1945. It was headed by Lt. Col. Sir Alan Mount who, with the railway officials, first visited the site. The District Engineer stated that the whole of the crossover area at Bourne End had been entirely re-laid with new metal just two years before. The signals consisted of a double yellow, indicating that there would be a changeover on to the slow line because of engineering operations in Watford tunnel. A Glasgow train had passed through safely only ten minutes previously. It was therefore presumed that the mysterious crash was due to an error made by the driver. The inspector told the inquiry he laid no blame, but the railway companies should consider some kind of automatic train control to warn of speed restrictions ahead and, in some cases, to automatically apply the brakes. Sound advice indeed!